If you don't stop it right now, I will take away ALL the Legos in this house. He must not have believed me. Not my finest parenting move, but I had to see it through to the bitter end. Can I tell you how painful life without Lego has been--for both of us? So it was as if the clouds parted and a heavenly ray of light shone down upon this battered but new box at Goodwill. The $2 tag matched the money he'd earned. I kicked in the tax. We leave thanking God for this little bit of grace. Hee Hee! The follow through can be so hard- good for you!! He did earn his things back, but it took almost a month. How long did you take them away for? Not permanently, I hope! Some Star Wars Legos for $2.00 and my son would be so excited! We already have too many Legos and I know how a threat of getting rid of them would be hard to keep. On Sat I was at a gsale and they had advertised Legos and K'nex - my sons two favorite things - but the prices were beyond garage sale prices...sigh. Oh, how well I know those moments! Levi is strong willed to the max - it's all I can do sometimes to follow through! I'm so glad for both of you that God blessed him with some new legos (and star wars ones at that!). What a great lesson in grace! It's surely challenging, but follow-through is so important with kids. Otherwise it's just an idle threat. 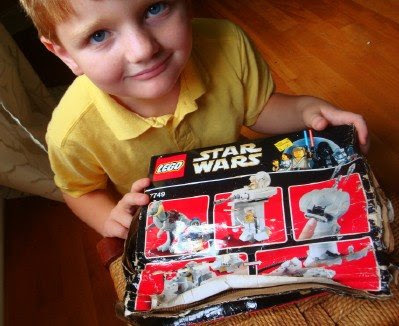 So for how long was his Lego "fast" before the Star Wars set came along? Wow...you weren't messing around. You meant TAKE AWAY the Lego's! I placed them atop the fridge on several occasions and you'd have thought I'd given away his puppy. A boy and his Lego's...serious business. I LOVE this post. Especially the part about God giving some grace to BOTH of you. thanks for sharing this parenting moment. I can definitely relate! Ah, those moments. So far, I have been lucky. When I've said something I didn't really want to follow through on, my son has actually behaved so I didn't have to do it. Thank goodness! Good for you fro following through. Sorry it punished both of you! I am already learning – with my 21-month-old daughter – that follow-through is one of the toughest part of this discipline business. I told my husband just the other day that dealing with discipline makes me want to crawl in bed and say, “I can’t be a parent! It’s just too hard!” We’re so blessed that MOST parenting moments aren’t like that. But wow, getting a dose of the hard stuff is enlightening, to say that least! This is a hard punishment to follow through with. Our DD (6) has a bad habit of not picking up her toys. We give her two warnings and then we pick them up and put them in the basement for a week, two weeks, etc. If she's interested in earning them back through good behavior after that, she can. If she's not (because she's become something of a wise guy recently), we donate them. I hate doing that, but what must be...must be. Good job for following through!! wow, what did you do with the legos? the few times i've made a threat that i regret, i've gone to ella and explained that i was wrong, that i shouldn't have said that, that i should have said or done XYZ instead, and that i am withdrawing the threat or punishment. i try to show by my example that admitting mistakes is ok, and that she is safe in coming to me to do the same. Do you mean that you gave all of his Legos away or just took them away for a reasonable period of time as punishment? I am sure that he has lots of other toys, but in reading your blog know that Legos are a particular favorite right now. I hope you just put them away for a time and he can earn them back. Whatever he did, he is learning a very hard lesson - even if you mean that he just lost them for a while! I think it is extremely hard to carry through on threats. I do think that Rowena is wise in admitting that sometimes threats are too extreme because we are angry and we need to acknowledge that. Oh... I couldn't imagine taking away the Lego! It would be taking away my fun time, too. :) I am trying to think of what I have taken away as a consequence of my young son’s disobedience…. movies. That's it! He would have to stay in his room while we watch movies on our movie night. It only happened once. He didn't like it at all. That was a few years ago. He is 11 now and I don't remember when was the last time I have to take away anything... well, hopefully I'll only need to talk to him instead of taking things away from this age on. Good for you to follow through. It's hard but so worth it. They'll know you mean business and hopefully will lessen the “how far can we push Mommy’s button” time. I know how that goes...When my son was about that age he was very into action figures. The threat was out of my husband's mouth before I could object. And within the day the action figures were history. My smart hubby boxed them up and put them on a top shelf in the garage. My son thought they were in the garbage. He opened the box on Christmas morning. They'd been in the garage for months. It was his best gift that year. I understand the hard job of follow-through...and the sweet grace God extends. Glad he found a few more legos. Thank you for sharing. UGH! I hate it when I utter words that I immediately wish I could take back because the afermath or follow through is just as painful for ME! :-) Good job on sticking to your word -- that is tough. Oh, how I remember when the discipline hurt me as much as the child. Especially when my son was little. Wow...I had a weak moment and one day took all the legos out of the room for a week. My son earned them back! It was quite effective but he has way too many to carry out of there! That sweet little face...how could you??? smile. wait a minute....you took the legos away and GAVE them away? WOW, you are brave. your son doesn't happen to be 4 and 3/4 years old, does he? i just ask because my daughter is (that 3/4 is very important) and is...well...challenging right now. and i have taken things away, to be returned later when behavior has improved. the challenge is making sure what i take away is punishing her, not both of us! He got a very good deal on those! I know Star Wars Legos can be pretty pricey! I'm glad (for both of you) that he has some Legos again. Often the most effective lessons in life are the toughest ones. haha - hilarious! We got rid of our TV for the same reason! I'm a stickler for following through. We have never had the Lego curse (only girls running around here these days), but I did have a "play food" incident once. Not pretty. I'm glad he found a solution! Looks like a great deal! Good for you following through. It can be so tough when to call it...but God knows, and made it real clear to you. My daughter, through irresponsibility and after being warned, too, broke my camera in the spring. She had to forfeit all of her summer job money to replace it. Halfway through, it became very clear she had learned her lesson and now it was time for a lesson in grace. I paid for the remaining half, and she was ONE GRATEFUL girl. What a great experience for both of us! Yikes! I hate when the punishment is as hard for me as for the kiddos. Glad you found a little sanity at Goodwill. Been there - done that - feel your pain! Hang in there, someday they will laugh at this with you. My 19 yr old daughter still talks about getting out the Lego and playing. There's nothing like it! I've done that plenty of times, but I put them in "time-out" for a certain amount of days or until I think behavior is better. Said toys hide in our spare bedroom, locked away. my husband is - lol! Did you really get rid of all that Lego? I am astonished. I have taken special things away from my children for a period of time and then given them the opportunity to reclaim them through genuine repentance and my forgiveness. What I have found hard but necessary at times is to ask for forgiveness if my reaction to behavior is too harsh. Oh....to be the perfect mom! A $2 set of Star Wars Lego's?????? a Miracle has rained down from heaven on you!!!! Congrats! I still don't know if you threw away the Legos or just put them away for a time but from the comments it seems everyone assumes you got rid of them. I thought you must have just taken them away for a while. When my husband was a child his dad threw away his transistor radio because he was listening to a ballgame late at night when he was told not to. That incident still brings back painful memories for him and some resentment. Grated, his privileges should have been revoked for a time but not his favorite possesion taken from him forever. After all, none of us follows the rules all the time and in my husband's case, the punishment in no way fit the crime. Sorry to be so long-winded. It's tough being a kid AND a parent! I hope the Lego Fairy brings Andrew's Legos back soon! "Oh, to be the perfect mom!" is right. Internet advice on parenting is one of the reasons I rarely write about it anymore. I won't be sharing the terms and circumstances of a specific punishment because they are not up for debate. However, you can rest assured that they fit the crime and were administered fairly and in a way that suits my child's individual temperment. Meredith, you are not perfect, I am not perfect. The only 'perfect' person died on a cross for us. No one expects you to be perfect. Being a parent is no easy task. I have been 'mothering' someone for almost 40 years now and I still get it wrong sometimes too. All any of us can do is our best. That is all anyone can ask...Like you said, you know your child; we do not. You know the 'crime' we do not. So what ever you did I am sure it was right for your family. Anyone who has read your blog for any length of time knows you are a great mother who puts the needs of their child first. I read your thoughts on parenting with an eye for the future. We have some strong willed showing through at just 12 months! You are a mentor for many of us newer mothers, even from afar. No judgement here, just gratefulness for your willingness to share your parenting style! Good job mom! I am doing some blog hopping and came across yours. I love Proverbs 31 and have read it probably a million (more or less) since I became a Christian 30 years ago. And you "opened your mouth in wisdom and the law of kindness was on your tongue." Good job. I have raised 2 boys and both are married and building their own household of faith. What a blessings. Stop by when you can for a dose of encouragement in the fine art of Christian mothering! Parenting isn't for the faint-hearted! I love it when I finally figure out what my child's currency is ~ you know, that thing that really makes them think twice about their behaviour and the consequences they will endure because of their own choices. I love it, not because I like to inflict pain or suffering, but because I have a tool to help me teach my children to be more discerning, self controlled and to really consider that their behaviour always has consequences ~ good as well as bad. Wait, did you take away the other Legos forever??? Like, gave them away??? That would be a sad day indeed. I think most parents are rather quick to offer parenting advice, even if it's only by sharing what works for them, it is a form of advice! Whether it is shared over cup of coffee or thru a blog post, most moms are eager to talk about the day-to-day struggles involved with raising our little ones. Every parent has to decide what form of discipline works for their child, household and circumstances. Being a widow, my 3 yr old son is lacking the stronger voice of a male, and I admit it's harder for me to follow thru sometimes, but I do try! Time outs are not very effective for him, so I usually put a toy or movie in "time out". I don't think I would take away a toy forever, unless (at an older age) it was a most serious offense, then I would have to decide based on the "crime". What is important is that each parent teaches and disciplines with love and with the best interest of the child in mind, and not the heat of the moment, easier said than done! And I personally agree with other commenters who said it's ok to admit it if we make a mistake, or reduce the punishment when the lesson is learned, as in the case of the mom who paid the other half of the price of a new camera! Children are just that, children, and are not capable of behaving perfectly all of the time or always making the right choice. It would be easier on us if they could! I think proper discipline is the most difficult aspect of parenting! I ditto Roxie. And I love Tracy's explanation of "currency." That sums up what this summer has been for discipline of our 5 yo. His old currency (traditional timeouts)was no longer effective so we were searching for a new one; tried loss of privileges and it wasn't quite right, then tried the 1 2 3 Magic method and that seems to be working: for him, for me & my husband, at this point in our lives. But we may need a different currency for our 2 yo. My point is: Meredith knows her family better than any of us and she was only mentioning the situation to give context to the $2lego bargain. What I noticed most about her story was that she WHISPERED the fateful words: I "know" but forget how changing volume downward can be just as effective as shouting at getting attention and much more polite. "I love it when I finally figure out what my child's currency is ~ you know, that thing that really makes them think twice about their behaviour and the consequences they will endure because of their own choices. " Meredith- don't try to read these things as a reflection. Parenting needs to be discussed. You brought up a valid issue- and a strong voice. One thing I've found in the long run is that if a parent is consistant in what they feel is right- the child turns out ok. Amazing that it works with almost every type of hands on- involved and loving parent. The loving and involved being the most important thing. You will have very nice kids because you are a brave, brave woman! Meredith - no judgment from me! I have had to tailor punishments over the years for my son and his various - and sometimes very creative! - "crimes". I also applaud you for allowing your son that moment of grace when he discovered the Legos in the thrift shop. Combined, these are the moments that build the man he is meant to be. I really like how you handled this - of course you had to carry through on your threat. Thankfully there was a way around it for you both. Diclipline hurts(for mommas and babes) but it make great well mannered children. Haha - it is punishment for mom as well isn't it? What a great find. Good for you for following through, that's the hardest part I feel. And I understand what you were really giving up, my son can spend a 1/2 - 1 hour quietly in his room playing with Legos allowing a little peace for me. Oh, Meredith, what a cute & sweet story. So glad you found those Legos on the thrift too. Good lesson for the little guy. You took all the Legos away for good? Wow! Good for you for following through with that one! What a great little deal for you son at the thrift store, I love his smile! Awesome find! Must be Heaven sent. Life without Legos? I think my boys might need prozac to survive that one. I thought I'd leave you a little note on this post, since the latest one doesn't have comments enabled. Although I'm sad you won't be posting, I'm happy that you have other things to focus on in life. I'm gonna miss your clever, creative ways to navigate through a thrifty sort of life. Even the Frugal Zealot called it a day eventually. Please drop by to see me, my friend! Of course, I'll still call ya for our little chats, too. We HAVE to get together again soon! Aw, I will miss you so much. I have learned so much from you. However I do understand. I will be taking my blog private soon. I will keep checking back in hopes that you do start posting again. Enjoy your break!!! Been there, done that, survived! You did the right thing--both times. Grace needs to be modeled too! I really liked this blog so I featured in on mine - I hope you donit mind? Meredith, I'm gonna miss this blog like crazy. Best wishes in everything - you and your family deserve only wonderful things. Hi Meredith. I stopped blogging for awhile, and am back now. I wanted to let you know I am putting your button on my blog. You do a great job!